This comprehensive volume on teaching peace and war demonstrates that our choice of pedagogy, or the way we structure a curriculum, must be attentive to context. Pedagogical strategies that work with one class may not work in another, whether over time or across space and different types of institutions, regardless of the field of study. This book offers insight on how to address these issues. The chapters contain valuable information on specific lessons learned and creative pedagogies developed, as well as exercises and tools that facilitate delivery in specific classrooms. 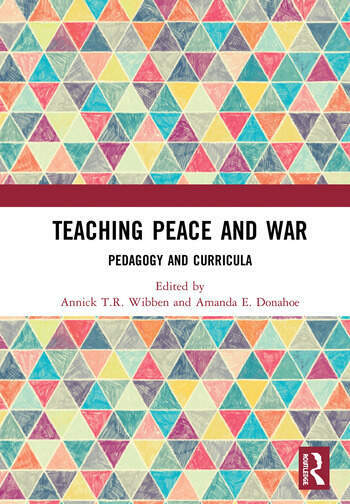 The authors address a wide range of challenges related to broader questions on what teachers are trying to achieve when teaching about peace and war, including reflections on the teacher’s role as a facilitator of knowledge creation. This collection offers a valuable reference for scholars and instructors on structuring peace and war curricula in different global contexts and pedagogical strategies for a variety of classrooms. The chapters in this book were originally published in the journal Peace Review. Annick T.R. Wibben is Anna Lindh Professor for Gender, Peace and Security at the Swedish Defence University in Stockholm, Sweden. Her research straddles critical security and military studies, peace studies, and feminist international relations. She has written two books, Feminist Security Studies: A Narrative Approach (2011) and Researching War: Feminist Methods, Ethics & Politics (2016). Amanda E. Donahoe is Assistant Professor of Political Science at Centenary College of Louisiana, USA. She teaches International Relations and Comparative Politics broadly, and the intersection of identity and peace/conflict processes more specifically. Her research focuses on gender and peacebuilding exemplified by her book Peacebuilding through Women’s Community Development: Wee Women’s Work in Northern Ireland (2017).